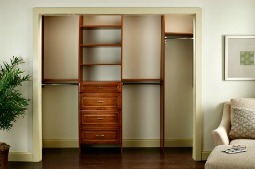 Maximize Your Space With Custom Closets! One of the many privileges of living in Canada is the opportunity to enjoy all four seasons. Custom closets can help when a new season rolls around and the dilemma begins.....where to store my winter clothes in summer, where to store the kid’s bulky ice skates or those winter boots that seem too tall to store comfortably anywhere. Closetguy.ca has the solution to all of your storage dilemmas! We specializes in Walk-in Closets, Reach-in Closets, Master Bedroom Closet Organizer, Pantries, Front Hall Closets, Laundry Room oganization and all other spaces in your home. We service the GTA including Toronto, Vaughan, Markham, Brampton and Mississauga. 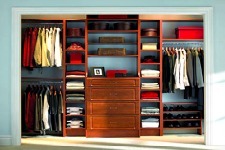 From consultation to design and installation, ClosetGuy.ca will provide you with unparalleled, personalized service. Each space is uniquely designed, using our state of the art 3D software to suit your individual tastes and needs. On installation day, we will arrive in a timely manner and work tirelessly to complete your new organized space quickly and with as little inconvenience as possible. This antique white, walk in closet is every shoe lovers dream! Organize your footwear, so that you can choose a pair at a quick glance to match your outfit of the day! Reach in closets are easily transformed to utilize every inch of space! This is done by adding more hanging space, shelves and pull out baskets, depending on your needs. Simplify your life by adding a beautiful, custom reach in hallway closet organizer, complete with double hanging and a variety of spaces for all your outerwear. Transform your child's bedroom by adding a custom closet. We can design your space that makes things easily accessible for your child, while also utilizing every inch of space available! Contact closetguy.ca for a free in-home consultation! © Copyright by ClosetGuy.ca. All rights reserved.